In my prime I devoured information, anywhere I could get it, like a hungry great white. I would talk sink tips or nymphing techniques from [insert your favorite European nation here] late into the night. But lately I’ve been lazy, or maybe just disengaged. I’m a mediocre to slightly above average angler who’s typically more interested in the places I’m in and the people I share them with than the fish count. Shooting photos often takes priority. In short, I have become less concerned with my fishing. Though I can still I can rely on a solid background to pick up fish, my learning curve hasn’t been as steep lately as it once was. Then out of the blue I got an email asking me to share my thoughts on “Three things I wish I knew when I started fly fishing.” John Lewis, in a Herculean effort, posed the question to 50 “experts” and compiled everyone’s answers. Considering Matt and I experts is generous, but we both took the time to respond. Our answers are simple, which makes sense given the question. But the more I think about it, keeping it simple is as relevant to a seasoned angler as a first timer. As I seek to improve in the coming year I plan to take Matt’s advice to heart, along with some of the great advice shared by others. But mostly I just hope to keep my fly in the water. You can only catch a fish when your fly is in the water –This was the first piece of advice I was given when I began fly fishing, but it took awhile to set in. Anglers can easily get way too caught up with casting and forget the goal…catching fish. Casting is simply a means to get your bug on the water. Cast less. Fish more. Keep moving to find fish – It’s easy to get caught up on cast, presentation, drift, but if fish are not there, you won’t catch any. Spend time learning to read water and where to find fish. Don’t be afraid to use your feet and cover ground, moving upstream or down after you’ve made a few casts in one spot. Expensive rods are not required – Sure the high end rods are nice but today’s low to mid range rods are really good as well. I own a number of high end rods, but have a sub $100 dollar rod that has become my go to for winter trout. I break lots of rods and like fishing one that doesn’t require its own mortgage, plus it happens to be very durable. It’s not about the fly – I recall being nearly paralyzed by the list of variables that I thought required attention when I started out. The biggest offender, by far, was (and in many ways still is) the infinite number of flies to choose from. How are you supposed to know which one’s “right”? You can’t, and at this stage it’s less important than you might think. Limit yourself to a couple of dries (perhaps an elk hair caddis and a parachute adams), a couple of nymphs (maybe a pheasant tail and a hare’s ear) and a utility bug, like a wooly bugger. Then you can take the attention and energy you would have spent on fly selection and direct it at broader categories such as… Are the fish eating on top or below the water? Are they eating big things or small things? It is about the fish – It’s really hard to catch fish where they aren’t. The learning curve for fly-fishing is infinite. That’s one big reason so many of us love it. It’s also a real hurdle to most newcomers. Of all the lessons you have ahead of you, focus first on learning to read water and determine where the fish are likely to be. Being in the right stretch of water is much more than half of the battle. 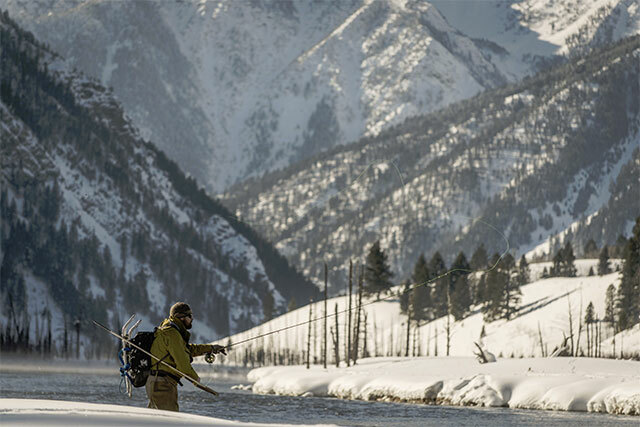 Ask dumb questions – Newcomers to fly fishing face a real language barrier and an unfamiliar culture that can seem more insular and intimidating than it should. If you’re respectful of people’s time and space, you’ll find that most are more than willing to share a little valuable info. Where are the fish biting? What bugs are hot right now down at the pond? Why do I keep getting these damn knots in my leader? Don’t be afraid of revealing your ignorance. I’ve found that asking dumb questions remains the best way of dispelling it. First published on Stalking the Seam, © Copyright 2017 all rights reserved.